L'Eclisse (English: Eclipse) is a 1962 Italian drama film written and directed by Michelangelo Antonioni and starring Alain Delon and Monica Vitti. Filmed on location in Rome and Verona, L'Eclisse is about a young woman who breaks up with an older lover and then has an affair with a confident young stockbroker whose materialistic nature eventually undermines their relationship. The film is considered the last part of a trilogy which was preceded by L'Avventura (1960) and La Notte (1961). In Martin Scorsese's documentary My Voyage to Italy, the director called L'Eclisse the boldest film in Antonioni's trilogy. 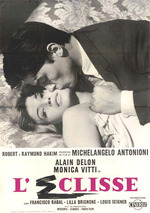 L'Eclisse won the Special Jury Prize at the 1962 Cannes Film Festival and was nominated for the Palme d'Or.